Los Angeles architect Kip Kelly designed the Hollywood Hills home that Friends actress Courteney Cox Arquette bought for $4.5 million after she got in a bidding war with comedian Ellen DeGeneres. Kelly, now a Lebanon County architect, also designed Marty’s Music Store along Route 422 in Annville. It’s the first of what he hopes will be a long lien of projects in central Pennsylvania. To get to the new Marty’s Music Store, just listen for the ringing bell tower and follow the piano keys embedded underfoot to the showroom. This is just a glimpse of what will await customers when they shop at the building in front of the Antique Depot on Route 422 in Annville Township, the new home for the longtime Lebanon establishment. What they always wanted: a door. Their Granada Hills bungalow was long missing a main entryway. Now they have that and more. Since buying their vintage Granada Hills bungalow in 1972, schoolteachers Mike and Jill Tovey have infused it with what she calls an ?arts and crafts, country eclectic style. The couple placed an old fashioned stove in the kitchen, installed claw-foot tubs in the bathrooms and adorned the walls with collectibles and old family photos. In 2004, the Lebanon Valley Rails-to-Trails program will cross an important bridge-literally. Though it is by means a large project, Marty’s Music Store blends metal construction products of various colors to make a big visual impact. 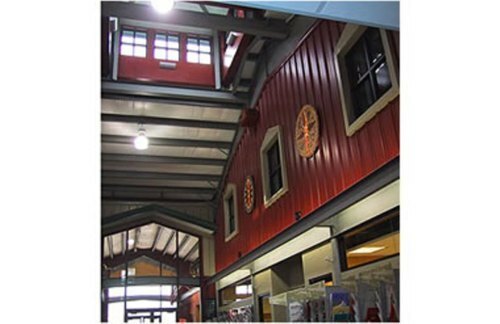 At the heart of the building’s construction is a metal building system by VP Buildings. Elements of the 105’ x 104’ x 21’ framing were used to enhance the overall design and are visible from both inside and out. Economy was one of the reasons why the approach was utilized. The building is topped with VP SSR standing seam metal roofing. The panel color is Felt Green. Two types of VP wall profiles were used on the project as well: 36” wide Panel Rib and 12” wide FP-12 soffit panels—in a Venetian Yellow color—are featured as the primary cladding, while the Classic Red FP-12 soffit panels were used vertically on both sides of the main customer entrance and to cover a large cupola. Both products were used on the interior of the building as well. Visit www.nestarchitecture.com to view additional photos of this project.